Most of our time in New Zealand I felt the landscape was alive. 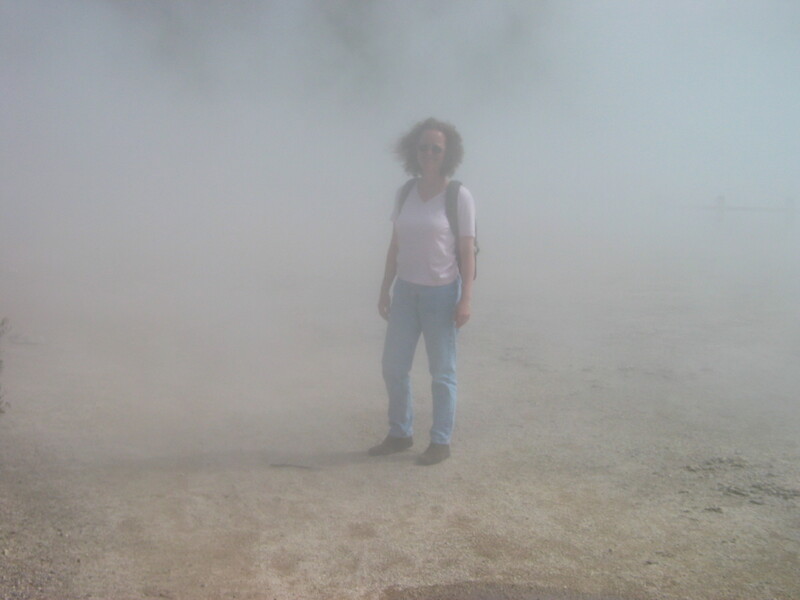 Especially on the North Island, I had the eerie sensation of standing on a very active volcano. 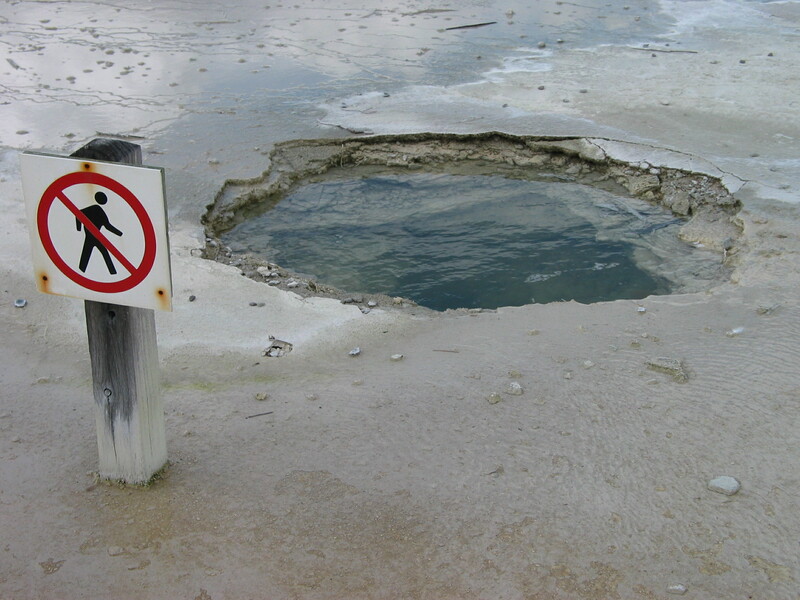 The ground steams in places, thanks to the underground hot springs everywhere. Three things remain fresh in my memory: Maori culture and architecture; the crisp Sauvignon Blancs that were all we drank; and the utter alive-ness of the nature. 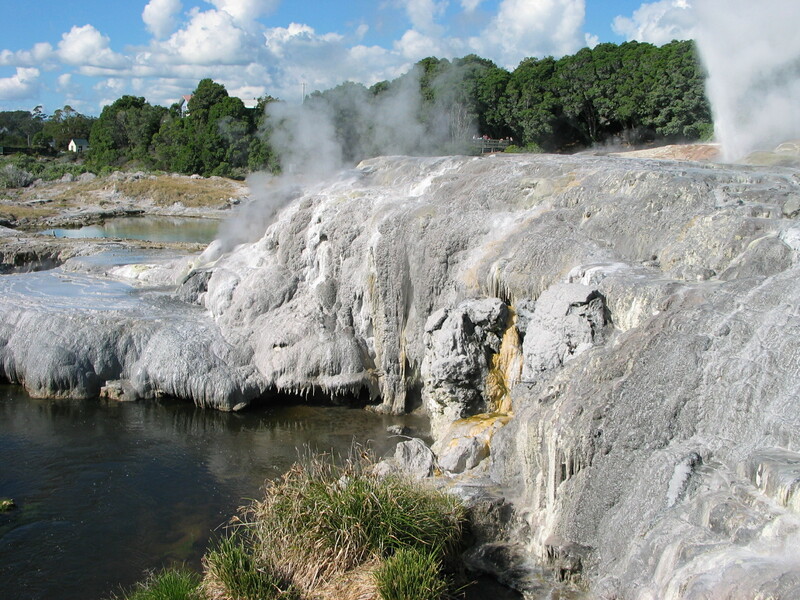 The charming city of Rotorua contains all three. 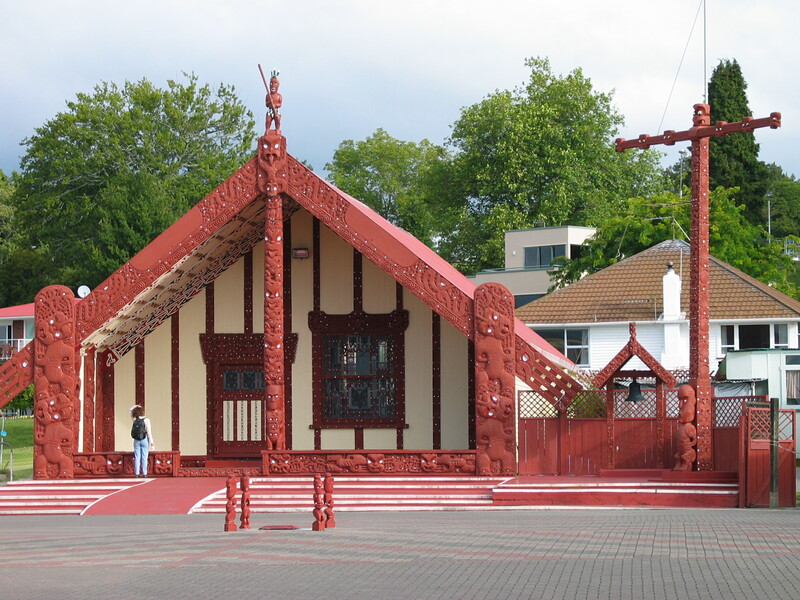 We could view the wharenui (meeting house) of the Māori people from outside. I was taken by the use of local materials, symbolism, and the symmetry and beauty of every traditional building. The Kiwis make great wine. When it comes to bottled grapes, I’m amused by the jargon. My own descriptions used to run to statements like, “A naughty little vintage. If this was a small child, I’d spank it and send it to bed without supper.” I loved it when I discovered that New Zealand’s Sauvignon Blancs are described as releasing a heavy whiff of cat pee when you first open the bottle. (I’m not making this up. Wine expert Jancis Robinson remarks, “Indeed one branded Sauvignon Blanc on sale in Britain is actually sold under the brand name Cat’s Pee on a Gooseberry Bush.”)* Yuck! If that’s the first impression you get from a wine, what could make anyone want to go past just opening the dang thing? It was worth the adventure to try one. We bought a bottle and opened it in our hotel room. Phew-ee! Sure enough, there was a heady stink of feral cat which thankfully faded immediately. I dared to fill a glass, took a sip… and was greeted by an explosion of quince, green apples, citrus fruits, kiwis and gooseberries. Those Sauvignon Blancs are so delicious that I never even bothered trying any other grape varietal while we were there. Why mess with kitty litter box perfection? And then there is the natural world. We visited parks where everything burbled, bubbled, exploded or engulfed us in clouds of steam. 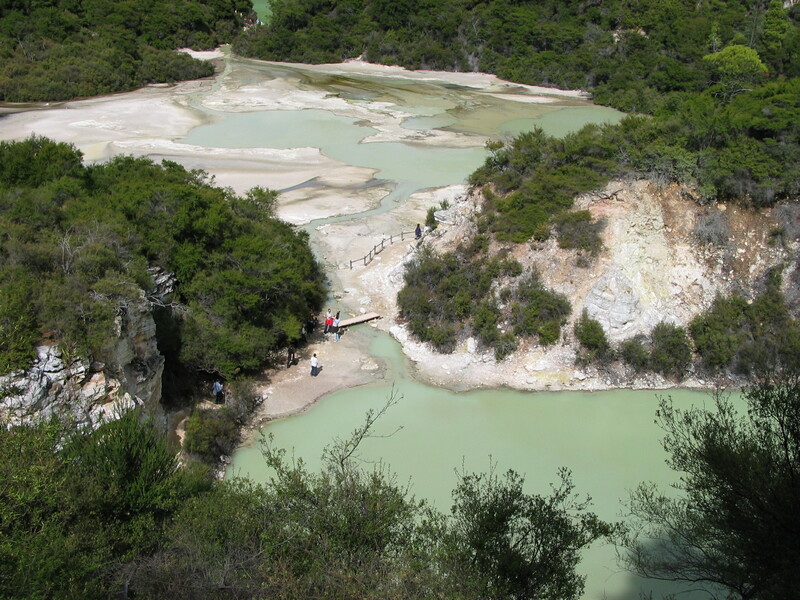 We did all of the hiking loops and were wowed by the spectacle of shooting geysers, blubbering springs, and mineral ponds containing colors I had no idea normally appear in Nature. In one park gift shop I purchased mud for facials that someone dipped out of a pond on the park grounds. No small feat as most of the park waters are at boiling point! 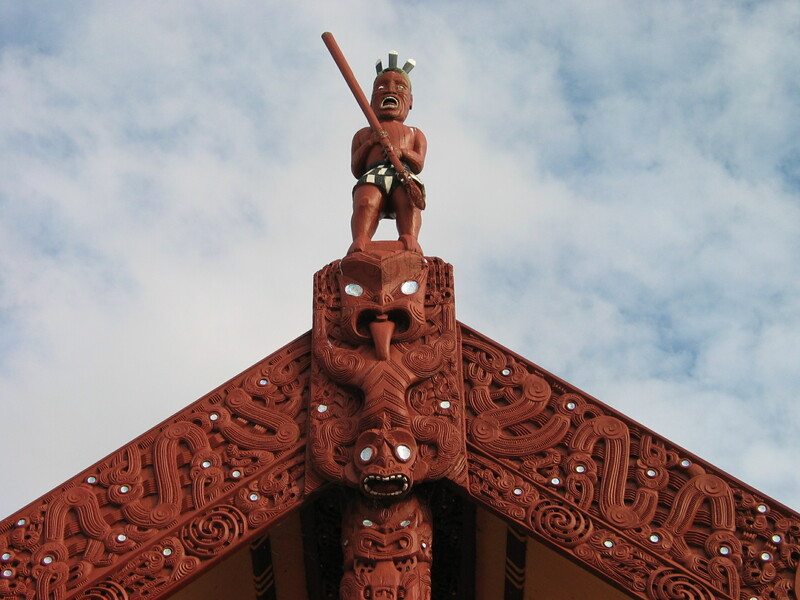 More pictures from New Zealand and Uwe’s photography may be viewed at viewpics.de. This entry was posted in Beauty, Culture, Maori, National Park, Nature, New Zealand, Travel, Uncategorized, Wilderness and tagged culture, geysers, hiking, hot springs, Maori, Nature, New Zealand, North Island, parks, Rotorua, travel, wharenui by Jadi Campbell. Bookmark the permalink. Hmm, could be. Though I’d like to think anyone smart enough to love NZ Sauvignon Blancs isn’t dumb enough to go hot spring temp checking. 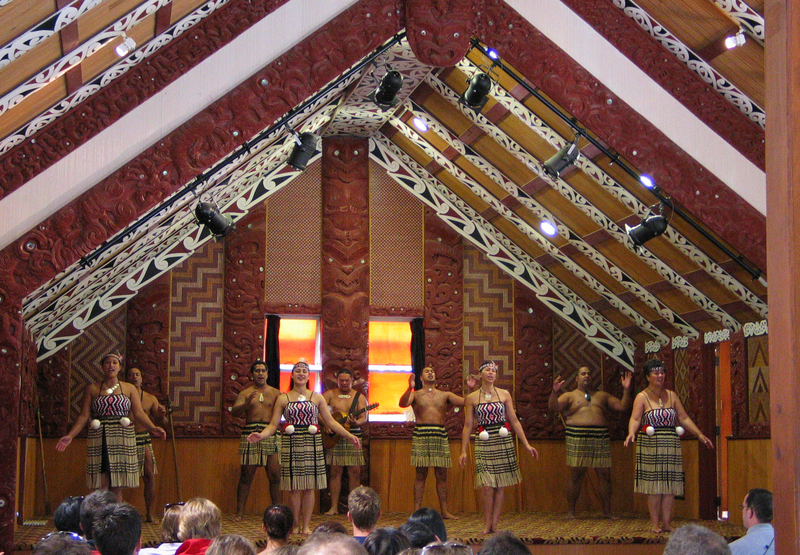 This is a trip we made almost a decade ago; we splurged on round the world tickets and spent a good chunk of time in NZ. I would love to return and will surely contact you when we do so! Some posts write themselves – I had fun with this one! Fantastic photographs Jadi and your commentary is just perfect. Enjoyed this post very much! Thank you. You are very welcome – thanks for taking the time to let me know you enjoyed it. Only those who can fit in, last. LOL! Thanks! This is one of the (very!) 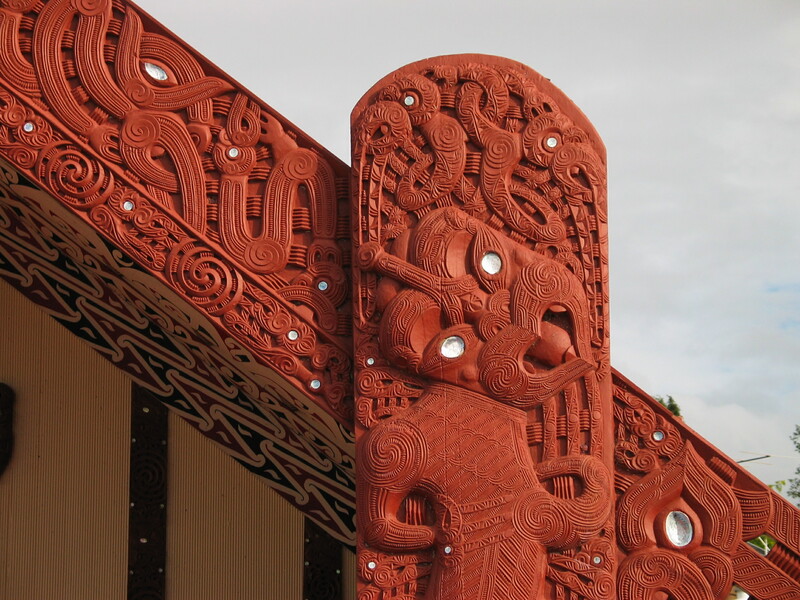 few posts where I can claim credit for some of the photographs: the pics of Maori architecture are mine. Very nice. Enjoy your weekend. Thanks! Just getting back to you now as we head into the Fourth of July holiday! What a great story! 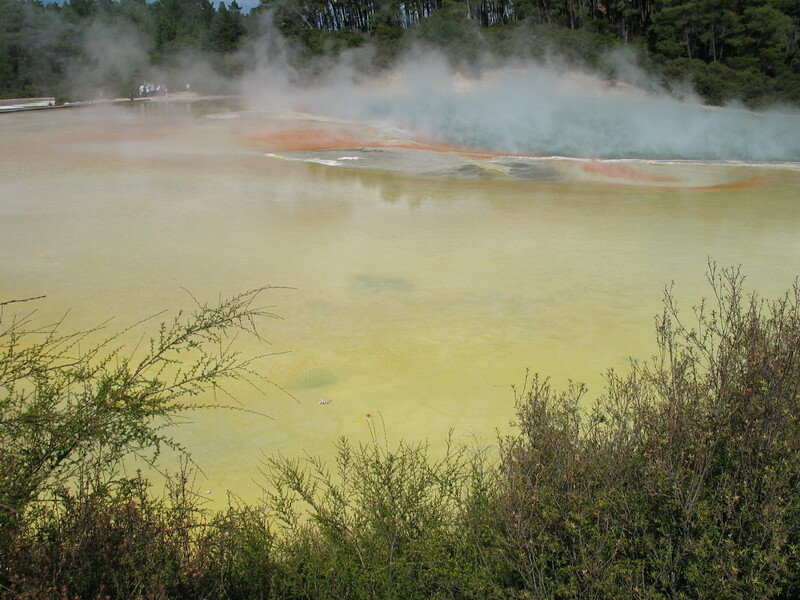 I loved everywhere in New Zealand but Rotorua is special. Did you see any of the sailing race in Auckland? Such crisp, dynamic photos! Thank you for taking me here. I love volcanic areas and could recall walking on steaming ground you describe. This was a time I could sense it as everywhere, and not just as an enclosed national park. 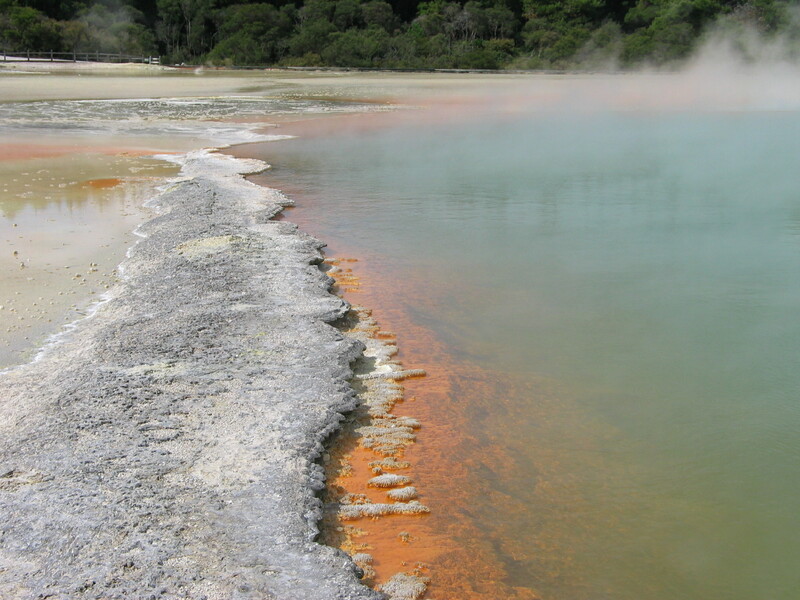 On Sicily we spent a few nights at Etna, but in Rotorua and indeed the entire North Island I felt the power of the volcanic currents as a whole. Magic, if a little unnerving at first! I can’t quite explain the sensation but suspect you experience it, too. 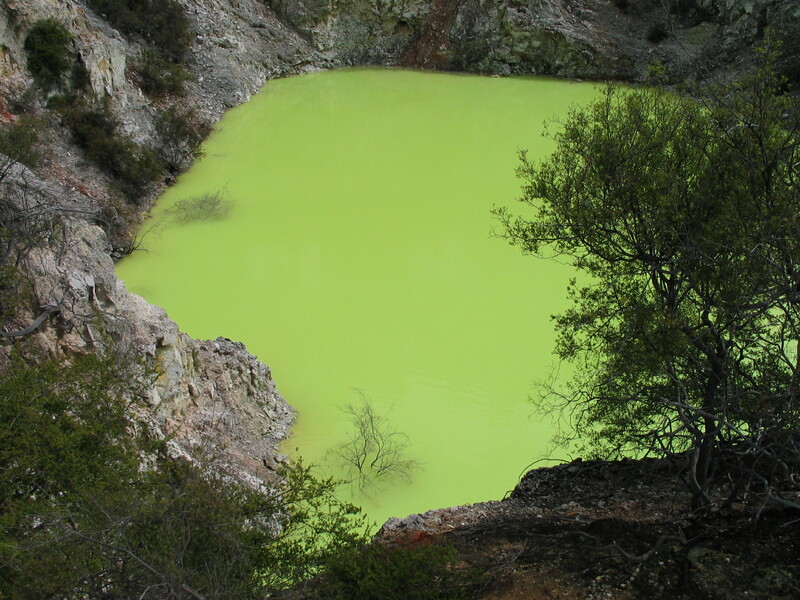 I remember the smell of sulfur when I was there. I also remember how much it reminded me of Hawai’i and the realization of how culture spreads. Thank you for sharing. I wish I had captured my journey as you have. 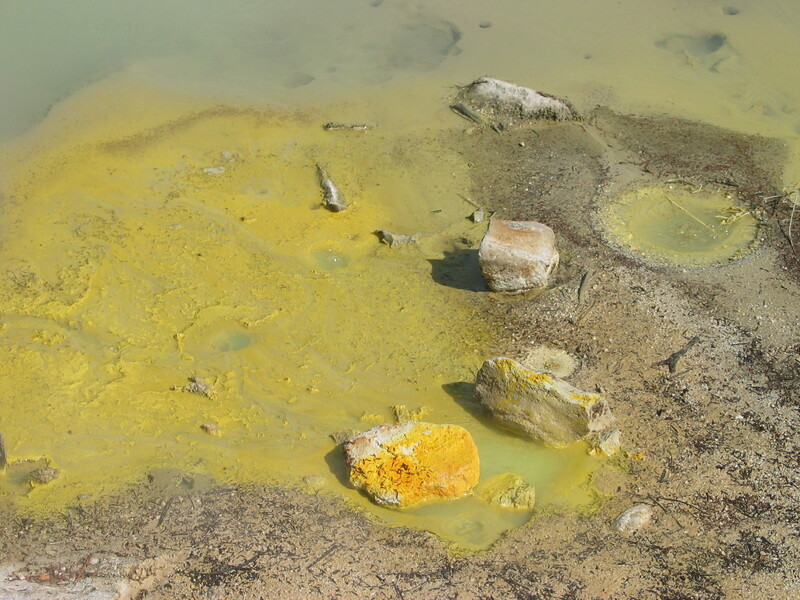 Oh my gosh, the smell of sulfur, yes! I have yet to get to Hawai’i but will keep your scent image in mind for when I do. We did this trip almost a decade ago and Uwe’s photos and my travel journals are the basis for this post. In many ways this blog helps me to relive and honor each place again. Like you, the crisp Sauvignon Blancs utterly captivated my taste buds during our New Zealand adventures. They don’t taste quite the same out of the country — I miss the smells and sounds of a NZ vineyard while enjoying the wine! I was able to go inside the meeting house at the Waitangi Treaty Grounds. It’s open to the public; we took off our shoes and were quiet inside, but it felt a little disrespectful. And you saw a haka! That’s something that’s still on our bucket list. Great post; thanks for sharing! How fortunate you were to get to go into a meeting house. The grounds were open but the building locked up tight when we were there. We did get to see the inside of a traditional building during the dance performance, though. Beautiful structures! Fantastic photos – those colors are so vivid and surreal looking! What a cool experience.